The INU presidency has rotated to Kingston University London for the term 2018 – 2020, after being located at James Madison University, Malmö University, Sweden, and LaTrobe University, Australia, in the previous years. 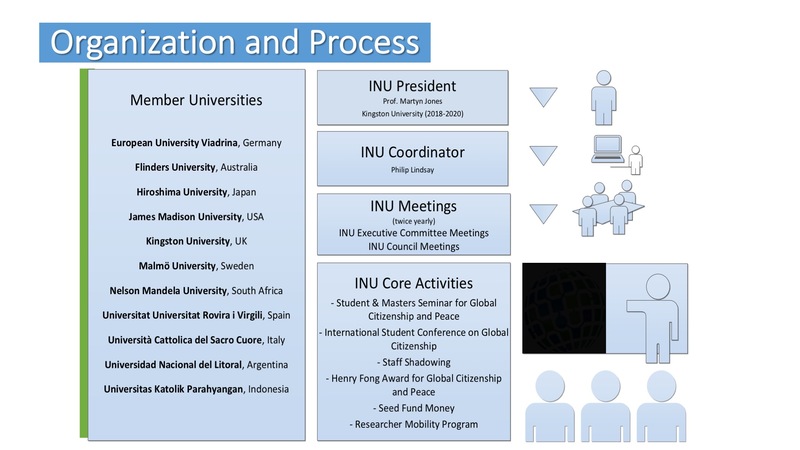 The INU office is responsible to plan and coordinate the INU mobility programs, joint research activities, internal meetings, and it coordinates joint grant applications. It is also the point of contact if you want to find out more on how your university can join the network. The INU Council meets twice a year. The Spring meeting mainly serves to plan an discuss the summer student program and update on any other ongoing activities. At the Autumn meeting the group decides on the annual plan for the next year and assesses activities and reports of currently programmes. Three Academic initiatives plan curriculum and upcoming events for the summer programs held at Hiroshima University, Japan: Global Citizenship and Peace, 2) Environmental Sustainability, and 3) Global Health and Nursing.